UK-based online retailer The Hut Group has revealed it is in talks that could lead to its Myprotein brand sports nutrition products also being available in some of the country's major retail stores. A spokesperson told just-food today (2 November) the group is "currently in discussions with major retailers and are looking into moving Myprotein products into the retail market in the very foreseeable future". Myprotein products include a new reduced-sugar snack bar in the UK for kids, which is being launched tomorrow as part of a range that aims to "nurture the early nutritional needs" of three- to 12-year olds. 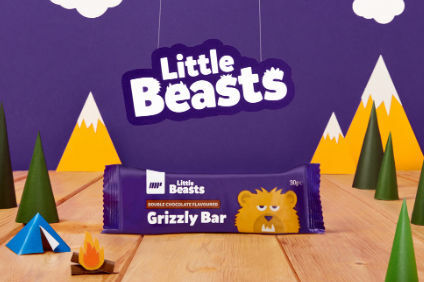 The new Little Beasts range is a "specifically-formulated capsule collection" including Grizzly Bars, Milkshake Blends, Fruity Drinks and Effervescents. Grizzly Bars are "made from fibre-rich gluten free oats and rice crispies with the added health benefits of coconut oil and natural whey protein", The Hut Group said. Each bar "contains 4.6g of sugar and 5.5g of protein per bar with no artificial colours or flavours". The bars also contain "around 55% less than your standard supermarket cereal bar and have been fortified with vitamins and minerals that will support cognitive development, the function of the immune system and normal healthy development". The 30g bars, in Double Chocolate, Toffee & Banana and Strawberry & Raspberry flavours, are available in packs of six at an RRP of GBP4.99 (US$6.10). The Milkshake Blend "contains an average of 8.3g of protein, 72 kcals and 5.9g of sugar per serving which is 78% less sugar than your everyday supermarket alterative", The Hut Group said. The Fruity Drinks are made from real fruit juices and purees with added vitamins A, C and E. "Each Little Beasts Fruity Drink provides over 5g of protein per 150ml serving to help support healthy growth and development. In addition, each drink is under 100kcal and contains no added sugar." The Effervescents, to be consumed in 150-200ml of water, can boost children's recommended daily intake "with 19 essential micronutrients including vitamin C, D, iron & iodine". Public health nutritionist Dr Emma Derbyshire said Little Beasts is "an innovative range of products... lower in sugar, fat and sodium than supermarket alternatives and use natural flavours and sweeteners". She said the range "is also particularly special in that it pays attention not just to important nutrients but also tastes, textures and proportions".